So, it’s come to this, has it? Well, frankly, we’re not surprised. 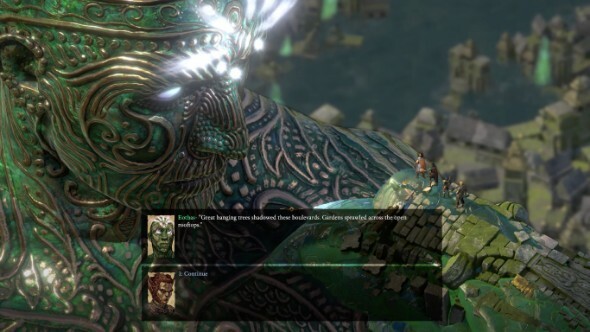 Pillars of Eternity II: Deadfire is an enormous game and its many ending states are relatively complicated. So you can either devote the rest of your life to discovering them all unaided like a CRPG monk, or read this. 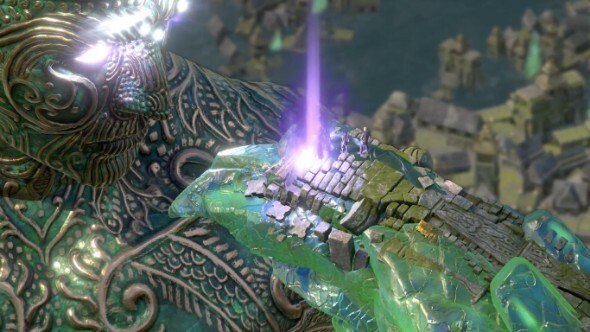 We’re working off the assumption that you’ve come here to spoil the ending of Pillars of Eternity II: Deadfire for yourself – please don’t use this for ill and ruin the enjoyment of this excellent RPG for anyone else. Unless it’s that one friend who told you what happened at the end of Infinity War. In that case text, tweet, and mail this to that one friend. Remember to check out the best RPGs on PC. This guide will cover the main ending, the effects of your actions on major regions and characters, and some party member interactions and outcomes for good measure. It goes without saying, but there’ll be spoilers ahead and reading the conclusions to such a grand story in this blunt form is always going to detract from the drama. We’ve said it and you’re still here, so let’s begin with the main ending itself. So you’ve followed the ancient god Eothas in his giant luminous adra form all the way to the ancient city of Ukaizo and learned of his plan: to destroy the great machine which controls the Wheel by which mortal souls are born and reincarnated. From here, you’ve got a few potential endings, only one of them with any cheer to it. 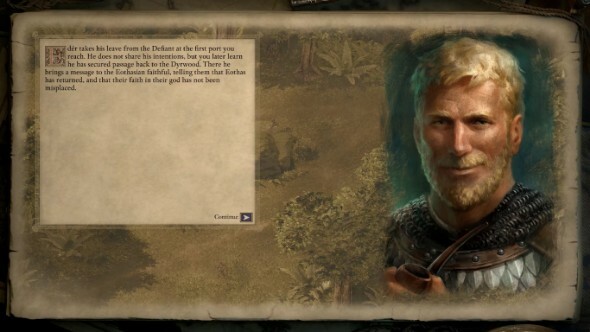 This is the ‘good’ ending to the main questline, and in order to achieve it you really just have to avoid the two triggers above. Eothas goes ahead with his plan and destroys the Wheel, freeing humanity of the lie of the Gods by ridding them of their power. 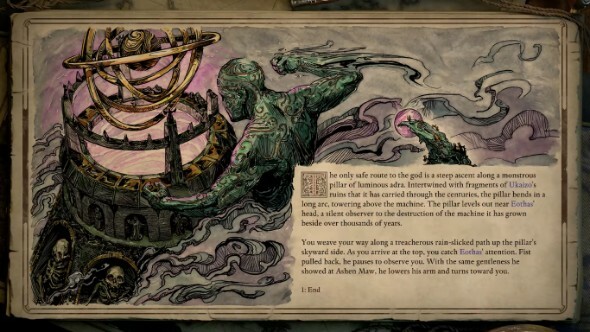 They were, after all, just humans who got a bit big for their boots, using Animancy to wield total societal control for aeons (side note: this was central to Pillars I’s plot, as Thaos and the Leaden Key were working to preserve this lie and keep modern animancers from discovering the truth). How life and death works after the Wheel’s destruction is left ambiguous, but it’s clear that people were born before it, and somehow life continues after it. Being a reasonably benevolent being, Eothas is receptive to your plea to help humanity, and so disperses the gajillion souls he’s being carrying around in that giant luminous adra and sends all that knowledge out to centres of learning and academia across the world. 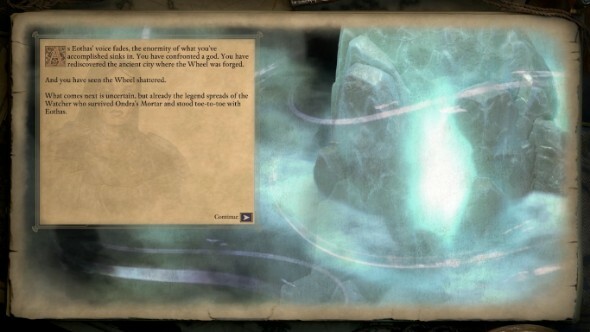 In the aftermath of his actions, wizards and scholars and suchlike make all kind of breakthroughs that help the people of Eora to understand the world around them that bit better. D’aww. Eothas also frees you from the burden of being The Palid Knight’s little helper, and with your advisal hands over stewardship of the realm to Berath, god of doors and cycles. The world stabilises under that stewardship, but also gets pretty predictable. Fewer highs, fewer lows. Note: there is, as far as anyone knows so far, no way to dissuade Eothas from destroying the wheel. We’re including this one in the interest of being thorough, but to our minds it doesn’t feel like much of a secret ending. It happens five minutes into the game, for starters. Nevertheless, people are calling this an ending out there on the internet so let’s describe the terms. Here’s where it gets tricky. The ending to the main questline seems like sunshine and rainbows until the narrator starts getting into the nitty gritty of what happens in the map’s various regions after Eothas’ actions. From what players have ascertained so far, there’s always a wisp of darkness to each conclusion. By reaching the ancient city without the help of a particular faction, you’ve averted what might have been a much bigger disaster in many people’s minds. Obsidian don’t lay the body count stats out for you, but that’s certainly the inference. 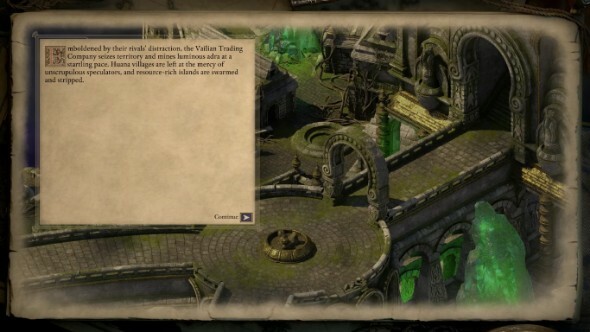 However, this has some unexpected knock-on effects for the Deadfire archipelago. With all eyes now on Ukaizo, Neketaka falls into disrepair, and the Deadfire Trading Company start getting pretty cavalier about their adra mining, which spells bad news for the Rauataians and Huana, who are too busy scrapping for Ukaizo to stop them pillaging their existing lands. It’s a bit of a mess – just as it was when you arrived. The inference of this ending is that aligning with a particular faction before reaching Ukaizo will result in that faction coming out more favourably than the others afterwards, but we’ve yet to test this out to confirm it. A dark and violent ending for Port Maje can be achieved if you let part-member Maia complete her spying gig, and finish the game with no single faction in charge of the island. With Governor Clario and Storm Speaker Ikawha both taken out, the Vailians and Huana turn on each other. The island becomes a war-torn place. If you stop Maia from fulfilling her task and instead encourage discussion between Clario and Ikawha, the two will govern the island in harmony. Up to you, big shot. Skip the Splintered Reef entirely and its inhabitants will continue to operate nefariously, luring in vessels to their doom in order to extend their already unnatural lifespans. Bummer. 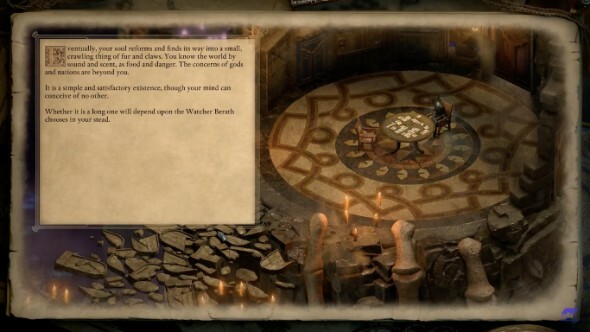 The many permutations of each party member’s personal quests, romances, and relationship with the player are still being unearthed by the Pillars II community, but we do know a few details already. Let’s start with that old softie Eder. One of several possible conclusions to Eder’s story is that after Eothas has his way with the wheel, he seeks out his old flame’s son Bearn and teaches him how the gods were all just a silly illusion designed to control honest working folk. Bearn takes the message to heart, and under Eder’s tutelage grows up to be a fine young lad who’d make his mother proud. If you don’t manage to discourage Bearn from following the Lighted Path, this ending changes into something more melancholy: Eder returns to find him angry that he refused to help Eothas and disappears for Hasongo soon after. Several other ending states are possible for Eder, but their triggers aren’t clear yet. He may return to Dyrwood and preach Eothas’ virtues, or return disillusioned and spread atheist sentiment. It’s also possible for him to end up in a relationship with Xoti, to become great friends with her, or to rebut her advances until their relationship becomes frosty. 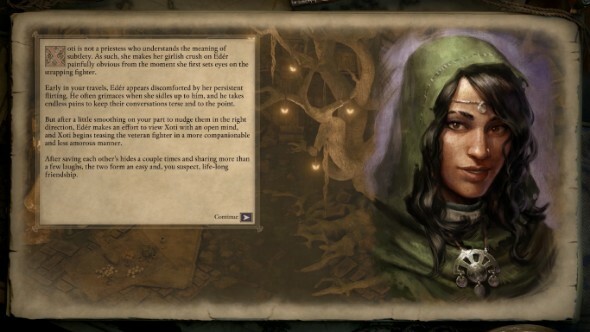 As for Xoti, if you end the game on amorous terms with her she’ll continue to write to you every day telling you about how much she misses you. Nice of her. If the two of you did initiate a fling but you later broke up with her, you’ll instead get a message about her not taking it so well, and having to slam the door to your cabin in her face. You heartbreaking jerk. Xoti can also end up with Maia or Eder, or as their ex. Complicated stuff, love onboard an adventurer’s ship with a bunch of single folks.